Skegness is being targeted in a campaign to tackle sewer blockages and flooding caused by putting the wrong things down sinks and toilets. More than half the blockages across the country are caused by people not disposing of wipes and cooking fats properly. Now Anglian Water is urging locals to take action to reduce the number. Keeping pipes clear means the sewers are not restricted by fats, oils and wipes and during heavy downpours, water can drain away more easily. 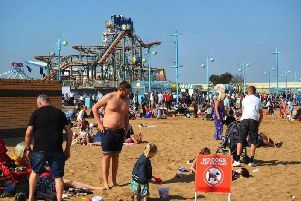 This Wednesday (August 27), as part of its ‘Keep It Clear’ campaign, Anglian Water will be on the promenade with a striking 3D street art display next to the RNLI station to remind people of the mess fats and unflushable items, like wet wipes and nappies, make of the town’s vital sewer network. Wipes and unflushable items along with cooking fats, oils and greases being wrongly placed in the sewers are the main cause of sewer blockages. More than half of the 30,000 sewer blockages Anglian Water has to clear each year are caused in this way; clearing them costs Anglian Water more than £7 million a year. Martin Taylor, collection manager for Anglian Water in Skegness, said: “By not putting things like food, fats and wipes down our sinks and loos, we can all help avoid blocked pipes, and the sewer flooding, inconvenience pollution and bad smells that result. Fats quickly cool and solidify once down the drain, blocking the pipes. When this combines with wipes and other sanitary items wrongly placed in the sewer, they form giant ‘fatbergs’ and blockages that are difficult to shift and can cause sewage to back up and overflow, flooding homes and gardens. Unfortunately, even the products marked ‘flushable’ do not break down in the sewer in the same way as toilet paper and can cause blockages. With one in every two adults in the UK purchasing some kind of wipe, this along with fats and greases is a rapidly growing problem. In Skegness, wipes and sanitary products should be put in the black wheeled bin along with food waste. Used cooking oil should be recycled where possible. Solid fat and small quantities soaked up in kitchen towel or newspaper can also be placed in the black wheeled bin. Martin added: “The Keep It Clear campaign is about getting everyone to understand the responsibility we all share to keep the sewers flowing and protect ourselves and our neighbours from the misery and inconvenience of sewer flooding. Over the next year Anglian Water will also be working with The Lincolnshire Community and Voluntary Service to help spread the Keep It Clear message. Residents and businesses can contact Anglian Water for advice by visiting www.keep-it-clear.co.uk. Customers are reminded to call Anglian Water on 08457 145145 immediately if they think they have a problem with their drains.